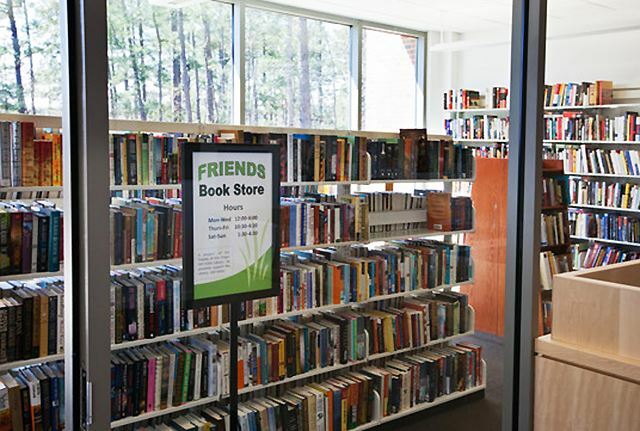 The Friends Book Store, located just inside the lower-level entrance to the Library, is stocked with more than 5,000 books in excellent condition at great prices. Explore a super collection of fiction and non-fiction for adults, young adults and children. Browse special sections on the writing life - all about writing and authors - and North Carolina authors and books of local interest. The store also has a selection of jigsaw puzzles, Friends tote bags and five years of banned book trading cards. If a book you want isn't in stock, you can request it and receive notification of if/when it becomes available. Monday – Wednesday: 12 p.m. – 6 p.m.
Thursday – Sunday: 10:30 a.m. – 4:30 p.m.